Once told by the head of Ealing Studios that a woman director wouldn’t be able to control a male crew, the late Kay Mander blazed a trail as one of the British documentary movement’s fiercest, most passionate voices. 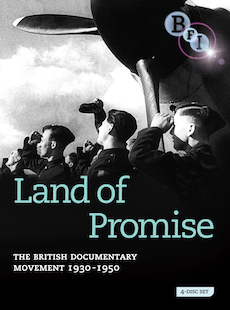 The late documentary director and ‘continuity girl’ Kay Mander was a prolific and innovative filmmaker who worked in the industry for over 60 years on both features and documentaries, including Homes for the People (1945), a key documentary highlighting the need for better housing in postwar Britain. Born in Hull in 1915, Mander grew up in Britain, France and Germany. In 1935, while working at Goebbels’ International Film Congress in Berlin, she met delegates from the British feature industry, contacting them for a job on her return to Britain. While interpreting for a German cameraman on an Alexander Korda production at London Films, she realised she wanted to direct. However, like many women in the industry she was employed in the publicity, budget and production departments before moving into continuity, although Korda had told her that continuity was “not a nice job” . In 1937, Mander joined the film industry’s union ACT (now BECTU) and in 1940 became the first woman elected to their General Council. Throughout the late 1930s, Mander became more politically conscious, joining the Communist Party and attending Left Book Club meetings. At the latter, she met members of the documentary movement, who convinced her documentary filmmaking was far more interesting and provided more opportunities to direct. All that was required was regular attendance in a Soho pub every Friday evening, the informal ‘Labour Exchange’ of the movement. It was here, in 1940, that producer Arthur Elton offered her a job as a production assistant at the prestigious Shell Film Unit, which had been commissioned to make training films for the Ministry of Information at the outbreak of the Second World War. Mander was soon asked to direct a training film for aircraft factory metalworkers, How to File (1941). She was praised for her innovative tracking shot showing the movement of the file. Honing her filmmaking skills at Shell, Mander developed a reputation for untangling complicated technical concepts with her clear, lucid and concise filmmaking style. Given the chance to write and direct longer narrative documentaries, she moved to Paul Rotha Productions and later to the Realist Film Unit. Mander was delighted to be finally directing actors and non-professionals, shooting on location and in the studio in these more socially conscious films. Eager to establish her own production company, Mander and her producer husband Rod Neilson Baxter formed Basic Films in 1944, where Mander made her most interesting and powerful film, Homes for the People. Partly inspired by the seminal documentary Housing Problems (1935), Mander’s film is more progressive and radical – five working-class women speak frankly about their poor living conditions. It’s a fascinating and rare glimpse into the everyday lives of ordinary housewives in the 1940s and their hopes for better housing after the war. Basic also made educational films and in 1949 Mander won a British Film Academy (now BAFTA) award for her French-language film La Famille Martin (1948), an educational film about a Parisian family, designed to teach children French. Buoyed by this success, she approached Michael Balcon at Ealing Studios, who told her a woman director would not be able to control a male film crew. Disillusioned, and blacklisted for her membership of the Communist Party, she joined her husband in Indonesia, helping to establish a local film unit and directing two films. Back in Britain she made her final film, The Kid from Canada (1957) for the Children’s Film Foundation. Frustrated by the lack of directing opportunities for women, Mander returned to continuity – working on films including the Bond film From Russia with Love (1963), Anthony Mann’s The Heroes of Telemark (1965), François Truffaut’s Fahrenheit 451 (1966) and Ken Russell’s Tommy (1975) – until her retirement in 1994. In 1995 I met and interviewed Mander about the films she made during World War Two. Initially she seemed intimidating and even a little irritated, but as we began discussing her career I realised that the greatest passion in her life had been filmmaking and she loved to talk about it: the people she had met, the places it had taken her, the intellectual, emotional and creative outlet it provided for her. Mander’s husband died in 1978 and Mander spoke of how the cast and crew of every film she worked on were like family, so she never felt alone. Film was her life; even in her 80s she was full of ideas for future projects and was writing a script about the First World War poet Rupert Brooke. She was also the subject of seasons at the BFI and Imperial War Museum, to which she contributed her often strident but always entertaining opinions. A documentary was made about her directing career in 2001 and a DVD showcasing many of her wartime documentaries was released in 2010. Sadly for such a spirited woman, Mander became increasingly frail. I shall remember her as a charismatic, fiery, intelligent, exasperating, funny, generous, strong-willed and extremely independent woman, who baulked at being labelled a feminist or woman filmmaker. As far she was concerned, she was simply a skilled film technician with a passion for the medium. Mander died on 29 December 2013, aged 98, in a nursing home in Palnackie, Scotland. This extensive collection is a major retrospective of the British documentary film movement during its period of greatest influence.